Everyone loves surprises! We cats aren't too keen on changes in our environment, but we do love surprises, especially when they are treats, food, and toys for us. 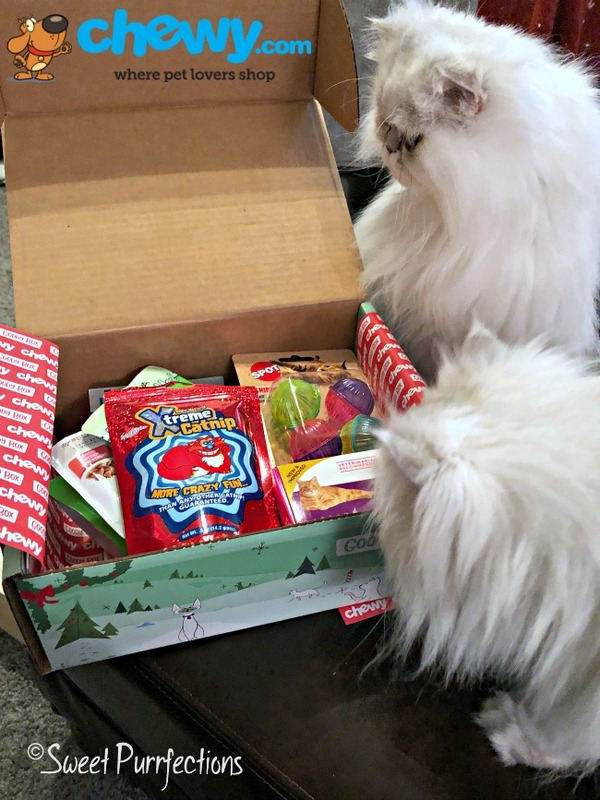 We were happy when Chewy.com offered to send us The Holiday Box Goody Box to review as part of our holiday celebration. 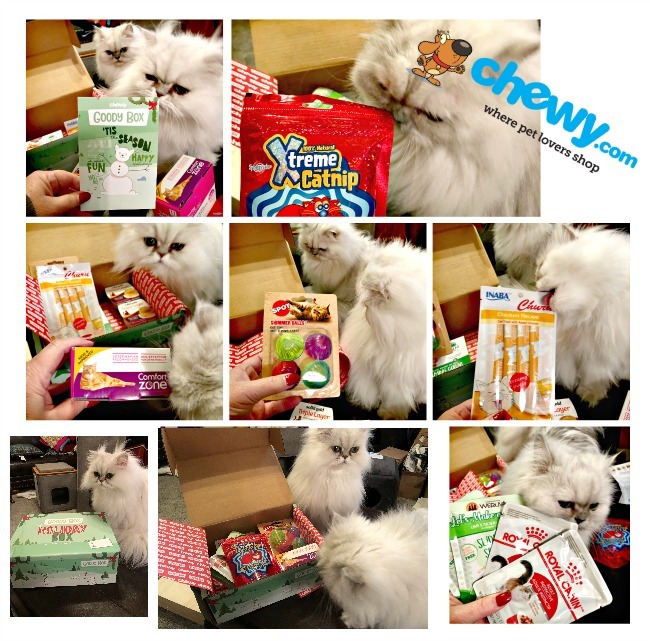 There are times during the year that Chewy.com offers special boxes for special occasions and they are filled with items that your feline is sure to love. We received the Holiday Box for Cats Goody Box and we weren't disappointed with the contents. There was food, treats, toys, and calming supplies. We've tried a few of the items in the box, but many were new to us. Solid Gold Triple Layer Cat Food. This food from Solid Gold is unique because of the 3 different layers of textured food. There is pate, smooth and whipped mousse, and shreds of turkey. We received the turkey and pumpkin recipe and loved the layer of pate and shreds of turkey. We weren't big fans of the mousse layer, but we know there are cats out there who will find it to be their favorite. Inaba Churu. This grain-free chicken puree lickable cat treat has been a favorite of our since we first tried it a couple of years ago. We like to lick the delicious puree straight from the tube. Mom Paula has also put some of this on top of our can food to encourage finicky Brulee to eat! Weruva Slide N' Serve Pate. We received the Lamb & Mackerel recipe. This recipe includes grain-fed lamb and mackerel. The packets are easy to open and slide onto the plate for your waiting feline to eat. We recently tried these new Weruva Slide N' Serve Pate recipes and are fans. We were a little hesitant at first with the different texture, but once we tried it, we loved it. Royal Canin Adult Instinctive Pouch. We've eaten Royal Canin cat food since we were kittens and the Adult Instinctive recipe was one of our favorite wet foods. These pouches are designed to be a great compliment to your cat's daily kibble with the optimum balance of nutrients. Ethical Pet Shimmer Balls Cat Toy. Cats love to play with balls and these are no exception. The balls are made of plastic and have a built-in rattler inside and makes an enticing noise as it rolls across the floor. Cats enjoy hunting these balls and batting them around. The openings in the plastic allow your cats to easily pick up the ball with their teeth or claws to throw about. Calm Paws Calming Cat Collar. If your cat wears a collar and needs something to calm her down, this may be the answer you are looking for. The color helps to ease potential feline stress by using natural essential oils such as lavender, that diffuse over time to help promote a sense of calm. The lavender oil is extracted from actual lavender fields in France. We don't wear collars or we'd wear these all the time! Comfort Zone Calming Cat Diffuser Kit. We have Comfort Zone Diffuser Kits throughout the house to help us stay calm. This calming diffuser mimics cats in the wild who release chemical scents - called pheromones - that signal safety and help relax them. The Comfort Zone Calming Cat Diffuser fills the space with the same scent to help keep them calm and relaxed. Truffle and Brulee aren't really stressed kitties, but they don't like change and there has been a lot around our home lately. The vet also thinks stress could be causing some of Truffle's issues with her eyes and bladder stones. XTreme Catnip. We think every cat loves catnip. This catnip is sourced from the high altitudes of North America. It's non-addictive and 100% all natural. You can use catnip to encourage your cats to use scratching posts or give it to them for fun and a good time. We love the idea of a Goody Box loaded with some of our favorite cat items and the chance to explore new items. We encourage you to check on the Chewy.com website for availability of the Goody Boxes. You can read about some of the past Goody Boxes here. 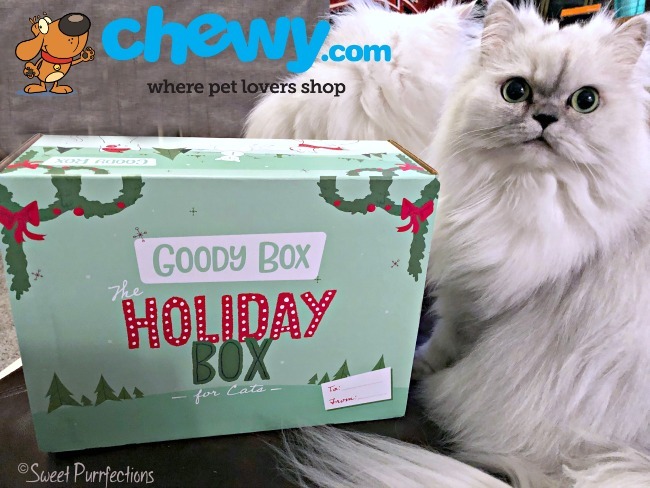 The wonderful people at Chewy.com have generously agreed to allow us to host a giveaway so two of our readers will have the chance to win a Holiday Box for Cats Goody Box. The giveaway is open to residents of the 48 contiguous states in the US, 18+ years of age, except where prohibited by law. The winners will be randomly selected randomly by Rafflecopter and contacted by email and will have 48 hours to claim their prize. Failure to do so will result in forfeiture of the prize and a new winner will be randomly selected by Rafflecopter. Please note that to qualify for a prize a comment must be left on this blog post. Giveaway closes January 24, 2019 at 11:59 pm Eastern Time. Oooooo, nice stuff! You made a good haul! That's is way cools! Buts I have the same problem as Juliana. I think the XTreme Catnip is something every cat would enjoy. My 3 cats would love all of these, especially the catnip! They go bonkers for anything with catnip lol! My three love the Inaba Churu! Though they would love the entire thing, box included!! My favorite is the Ethical Pet Shimmer Balls Cat Toy because my two girls absolutely love to play with balls. What a spectacular box! Lexy would really love that catnip. I have three kitties and they would love the catnip because they are just crazy for it. That is a super cool box of goodies! How awesome that you are getting to give away boxes of these awesome goodies! Great assortment! I would probably like the catnip the best. Oh the triple layer Solid Gold sounds like it could be good! It's great that you got to try out some different foods. Variety is the spice of a finicky cat's life. Thanks for the reviews! We will try adding some Inaba Churu to our next Chewy order. Those boxes are SO amazing!!! I'd like to see how the Xtreme catnip makes the kitties react. I'm most excited about the Weruva Slide N' Serve Pate. My cat eats Weruva chicken (it's the one he liked most from that line). He has issues with most food, but this one works. I've love to try this one from a different line to see if he liked it and if it agreed with his system. My cats love getting presents in the mail!!! I think the favorites for me on this is the Royal Canin food, which they eat already! and the diffusing kit!! Helps to keep "order" around here with 8 cats! So many great items (between my three daughters and I, we have eight cats so we always share the wealth). As for my favorite item in the box, I asked my two cats and got two different answers. Kotoha, my 2-1/2 year old formerly feral kitty, loves balls that jingle more than just about anything else so she told me to pick the Ethical Pet Shimmer Balls Cat Toy. However, my senior girl, Moko, has been dealing with medical issues for over 2-1/2 years now (we almost lost her two years ago to a severe allergic reaction to a medication - she's a hyperthyroid kitty who isn't gaining weight, even with her medications) would want the Comfort Zone Calming Cat Diffuser Kit to keep her calm. She spends most of her time on our cat tree and I have an oil diffuser with lavender scent to help relax her, but this would be so much better! there are several i like. the Solid Gold cat food, which sounds very nice and the balls. great toys for the cats to play with. Weruva is also a very good brand. i have brought their dog food previously in the pouches. My granddaughter's kitty would love. Our favorite item from this box is the Weruva Slide N' Serve Pate! My one cat Jayce would probably love the food!